BOSTON – It is the final days of World War II, and while the city of Memphis is still on war footing – with almost all of the able-bodied men involved in the war effort and goods still in short supply – there is an air of anticipation because the war’s end will bring the return of the soldiers and hoped-for reunions. 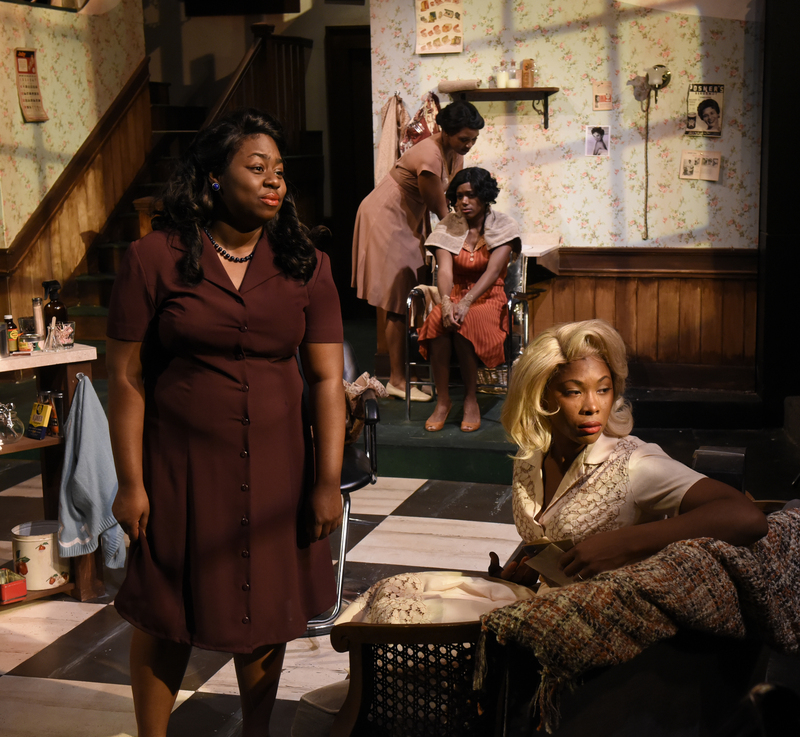 That goes double for the women who live in Miss Mary’s Press ‘N Curl, the site of Katori Hall’s “Saturday Night, Sunday Morning” now at the Lyric Stage Company of Boston. “Saturday Night” is more satisfying than Ms. Hall’s well-received but uneven “The Mountaintop,” which was presented at Central Square Theatre in 2013, a fictionalized account of the last hours of the life of Dr. Martin Luther King. This piece seems more firmly grounded in its subject matter – indeed, Ms. Hall has said she is “as Memphis as it gets” when it comes to her hometown. Hall is at her best here when painting vivid character portraits and delivering dialogue that feels right amid a skillfully balanced blend of humor and drama. The camaraderie among customers in black barber shops/hair salons has been explored in movies such as “Barbershop” and “Beauty Shop,” and Hall adds her vibe. 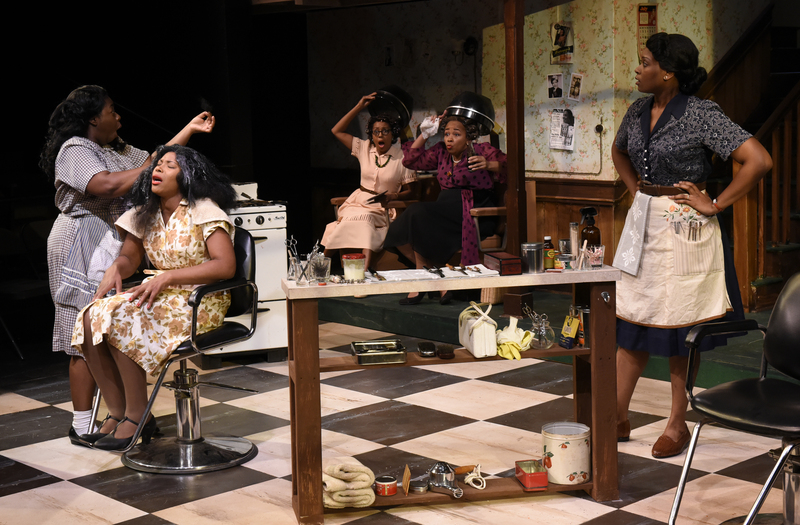 Miss Mary’s Press ‘n Curl is struggling to stay open, beset by nearby competition as well as the all-too-familiar financial struggles of African-Americans of all stripes and the women who live with Miss Mary (Jasmine Rush). Miss Mary’s husband died early in the war, and the hair salon/boarding house provides income and company that dulls the loneliness of a war widow. The queen of the walk is the sensuous Leanne (Jade Guerra), a former beauty queen who is inconsolable that she has not received a single letter from boyfriend Bobby (Omar Robinson) during his four years of deployment. She spends her time lounging around the salon in nighties and robes,waiting for a letter that may never come. Mabel (Cloteal L. Horne) is not waiting for her soldier husband to return, making time with the menfolk who are available, including mailman Buzz (Keith Mascoll), while her plainer younger sister Taffy (Meagan Dilworth) mulls ways to attract men, and whether to embrace her “Cherokee mane” – or press the curls into submission, al la the relaxers or straighteners that are popular. Into the salon walks Gladys (Tasia A. Jones) a young church-going woman from Birmingham who is different from many of the others – she can read and write, and even has typewriting skills. Ramona Lisa Alexander and Jackie Davis are Dot and Jackie, two of Miss Mary’s regulars, and their appearances juice up the goings-on quite a bit, with their ears and noses for gossip. Always lurking is the racism of the time, including the menial assignments doled to most of the blacks who were part of the war. Gladys is reluctantly drawn into a plot to write a letter from Bobby to Leanne, to bring her out of her funk, playing Cyrano of “Cyrano de Bergerac” to Leanne’s Roxanne. But Gladys has her own reasons for getting involved, and the theme of Sapphic love is a real game-changer in 1940s Memphis, in the heart of the Bible Belt, and especially among women already marginalized simply for being black. Hall has also infused “Saturday” with a supernatural aspect, as she did in “The Mountaintop,” with an imagined encounter between Bobby and Gladys gilding the lily on what we already know is going on. Omar Robinson lends substance to Bobby while Keith Mascoll’s Buzz is an easy-going opportunist who sells Miss Mary a product that will turn the salon inside out. Mac Young’s set is an eclectic combination of salon tools and living space, featuring a vintage Coca-Cola cooler that was painstakingly restored. Director Dawn M. Simmons has elicited strong performances across the ensemble. With her feel for the rhythms and pace of life in her hometown, Hall’s “Saturday Night, Sunday Morning” has the feel of a satisfying meal or – in this case — a hair treatment of tonsorial excellence. The Lyric Stage Company production of Katori Hall’s “Saturday Night, Sunday Morning.” Directed by Dawn M. Simmons. Scenic design by Mac Young. Costume design by Elisabetta Polito. Lighting design by Ian W. King. Sound design by Kelsey Jarboe. At the Lyric Stage Company through Nov. 21. http://www.lyricstage.com.